There are a lot of talented members in our guild! 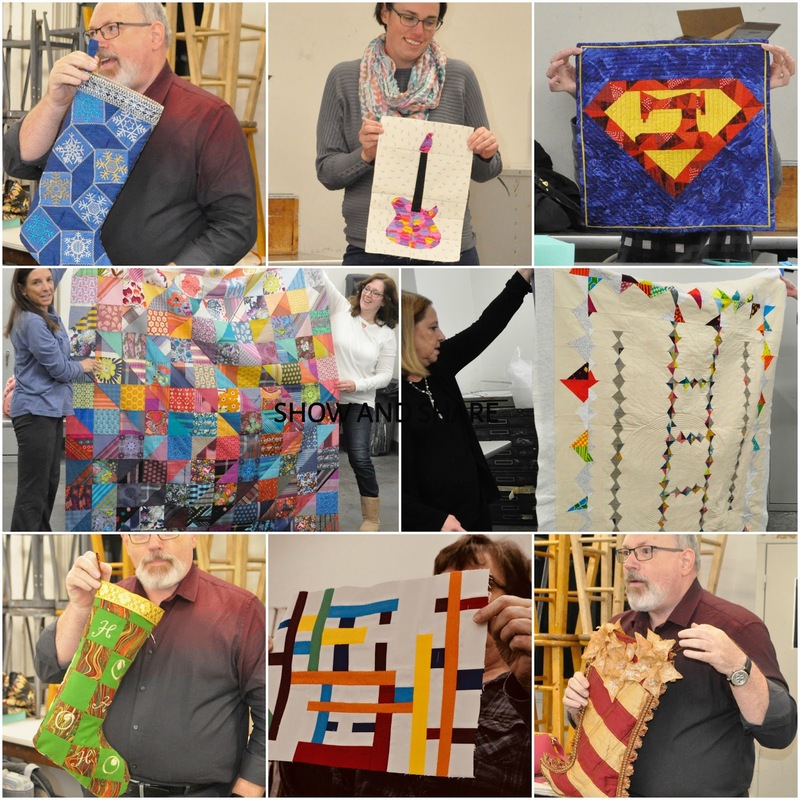 The show and share section of our meeting is my favorite. Members display their creativity, charity, and workmanship. 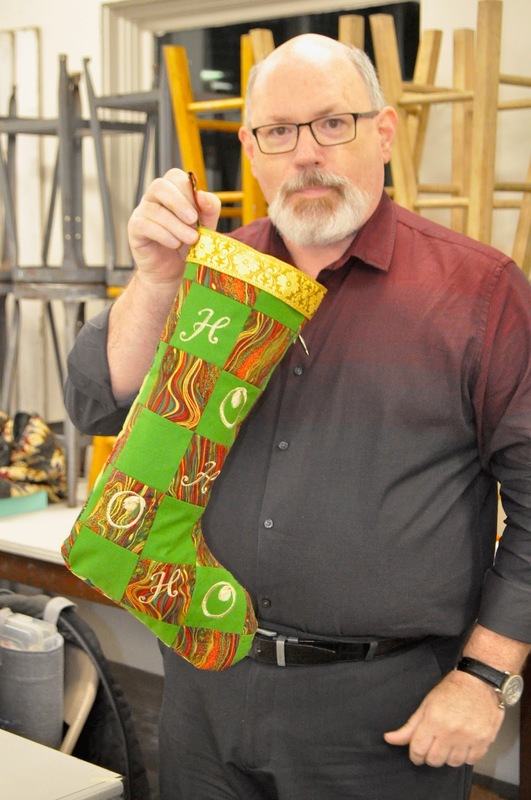 Mario makes beautiful stockings that will be auctioned off for a charity. 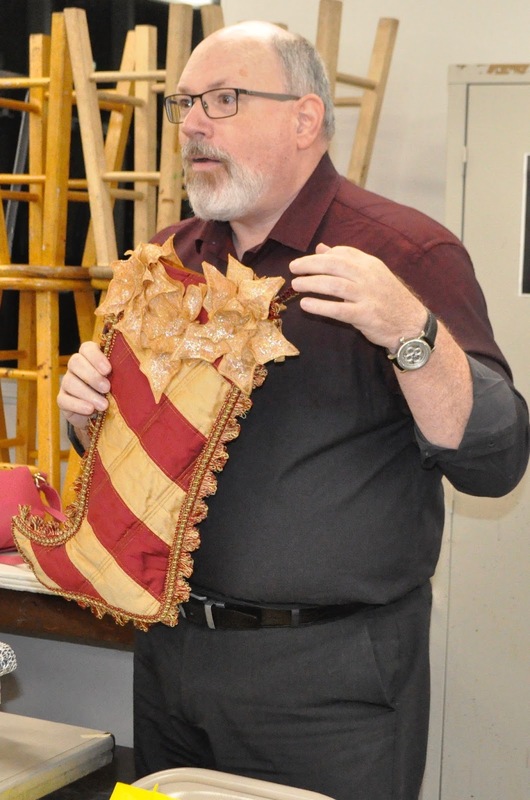 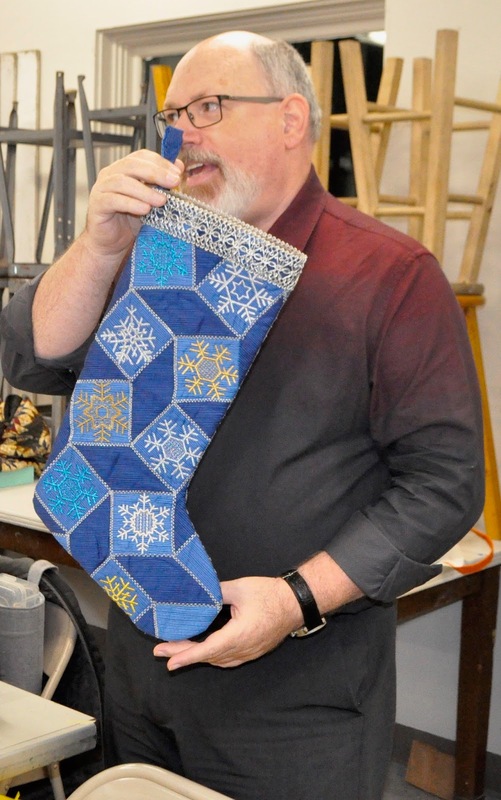 His stockings show his creativeness and sewing skills. 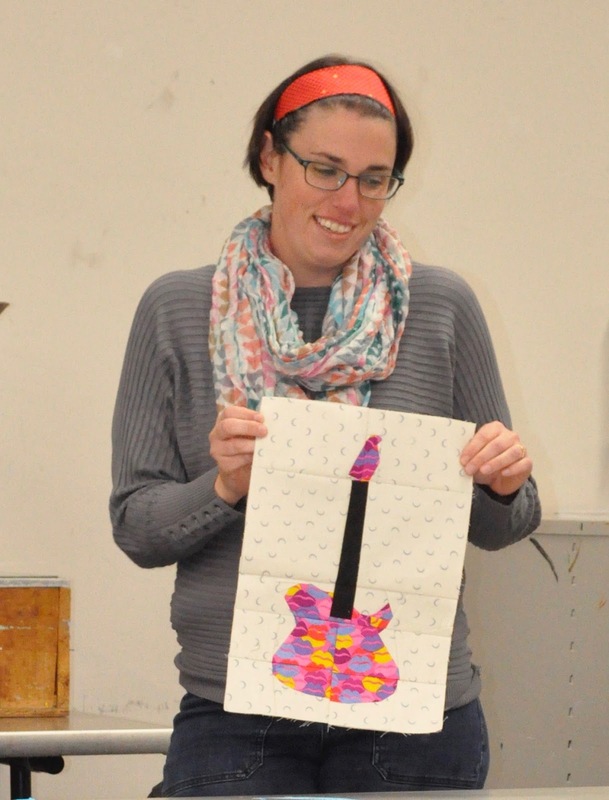 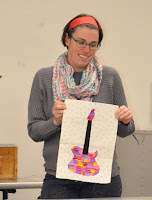 Nancy's guitar block was creative and FUN. Colleen's whimsical "Super Sewing" machine is awesome! Susi's AntiTrump quilt showed how to incorporate improv piecing into your quilt design. 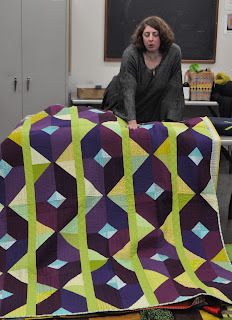 Carol also demonstrated her take on improv piecing. 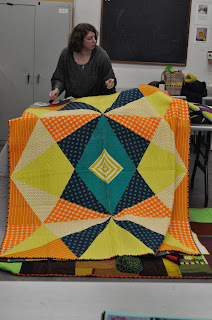 Hope she turns this sample block into a finished quilt. 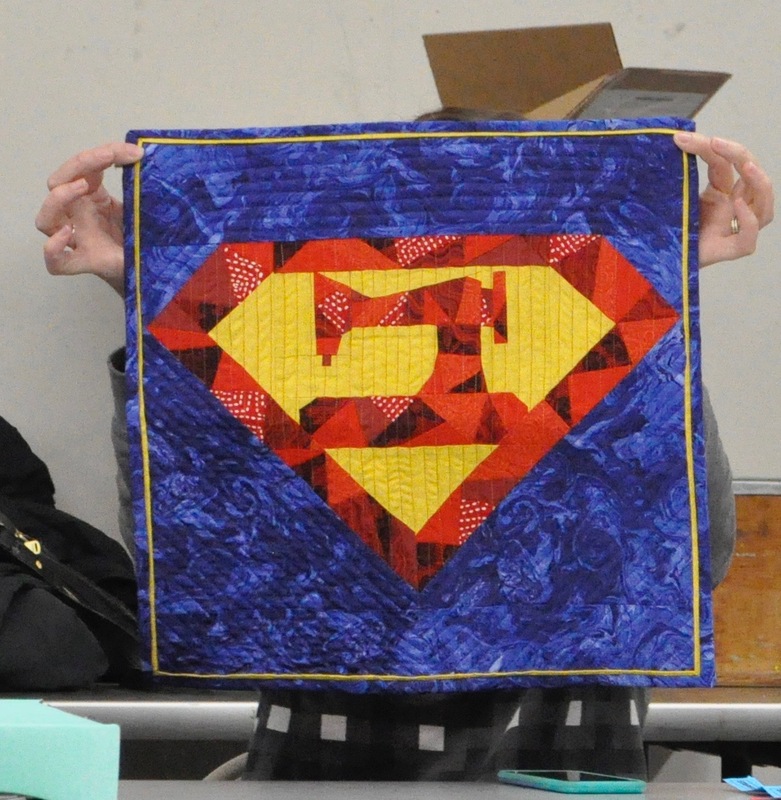 Lorraine has been working on a quilt that she started at a class she took @ QuiltCon 2017. 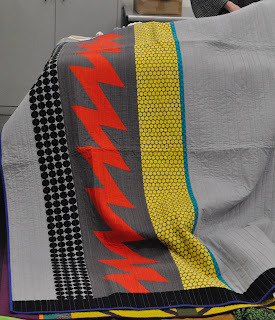 Color placement is wonderful. 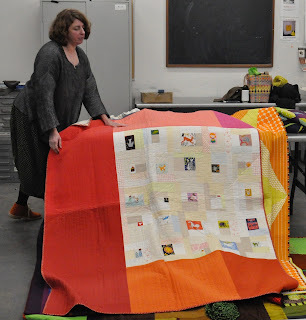 What a wonderful treat to have Deborah Fisher at our meeting. 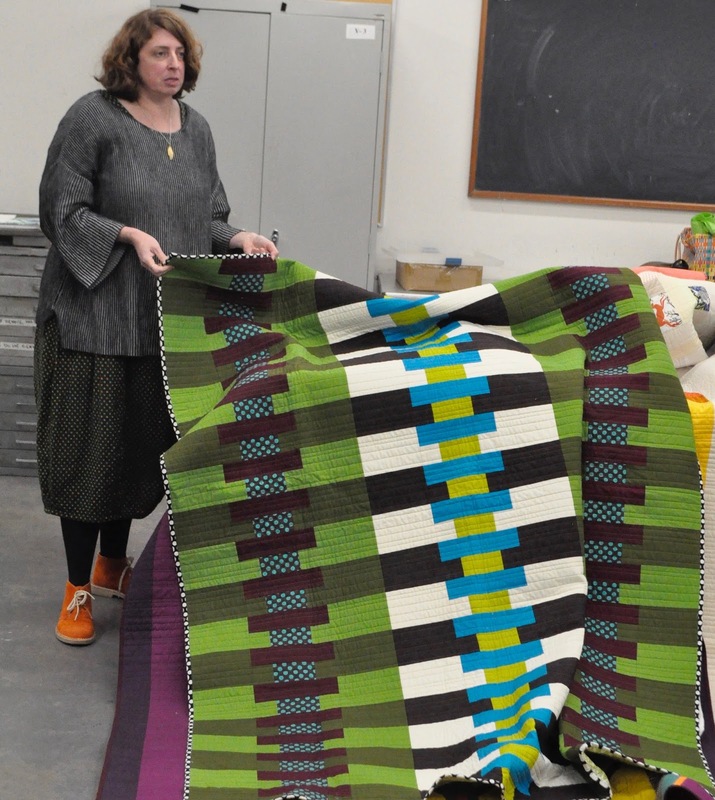 She told us two stories of her life in the quilt and ceramics world. 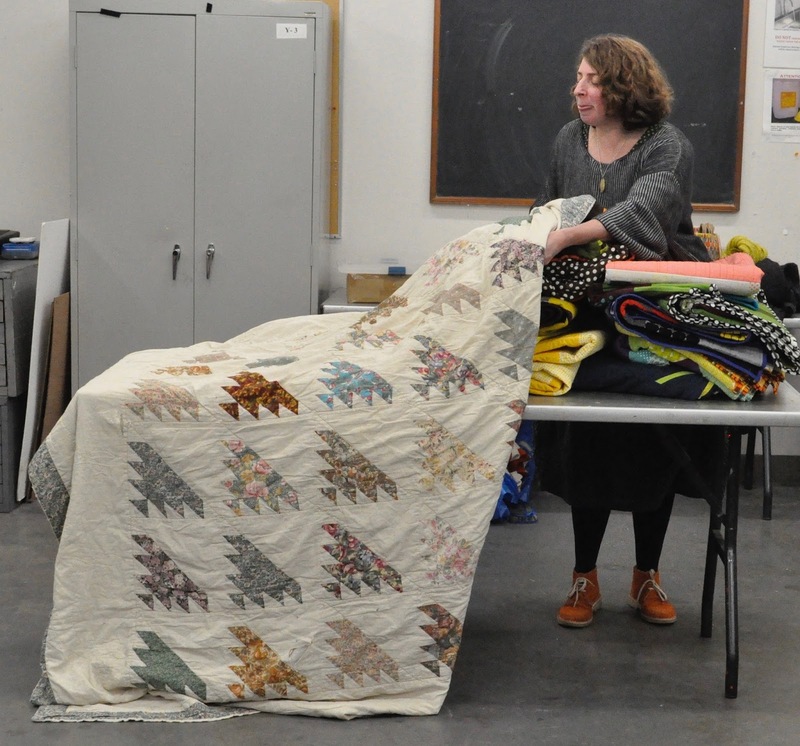 She brought several quilts that she received and created to illustrate her quilt story. 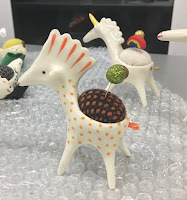 She also brought in samples of her ceramic creations that help to illustrate her ceramics story. 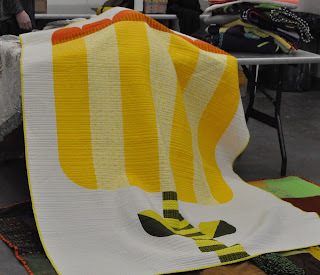 Her first introduction into the the quilt world was in the 1970's. She watched her mother create quilts from sandpaper templates. Then she went off to college and grad school and earned a BFA and MFA. She was is a fine artist, and studied fine textiles and mixed media. 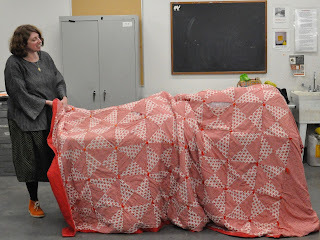 She received a quilt from her husband's aunt (self taught quilter) for their wedding. 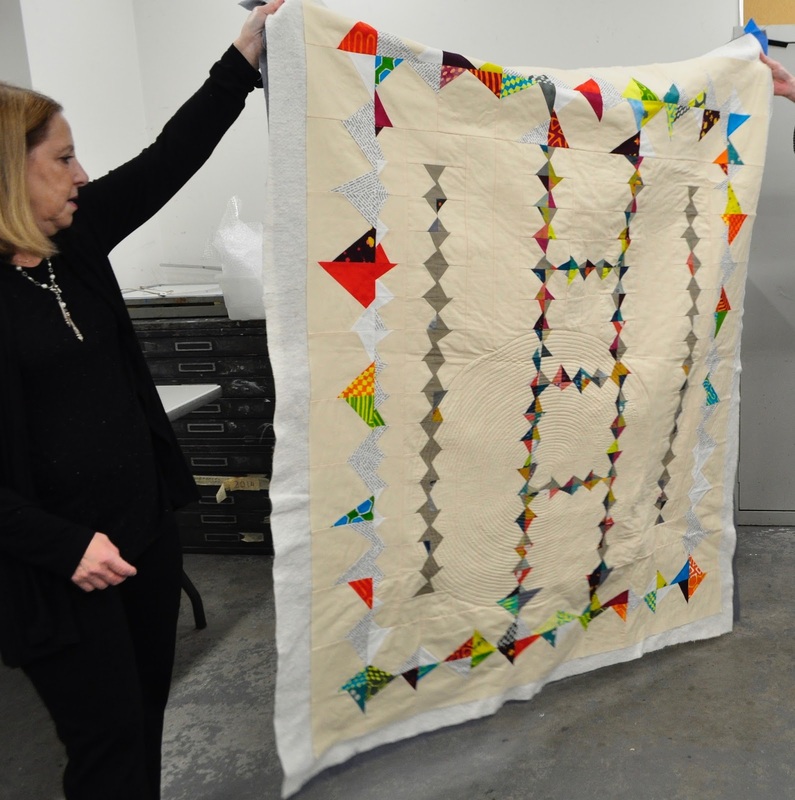 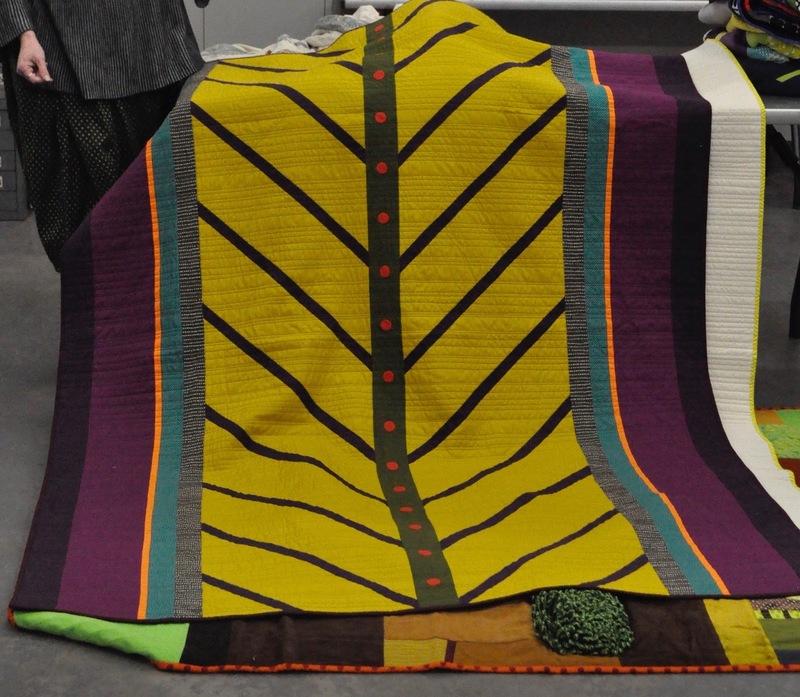 She took this quilt with her on the 3 month residency program she began at The John Michael Kohler Arts Center in 2003. Once she placed this quilt on her bed, she got a sense of home. 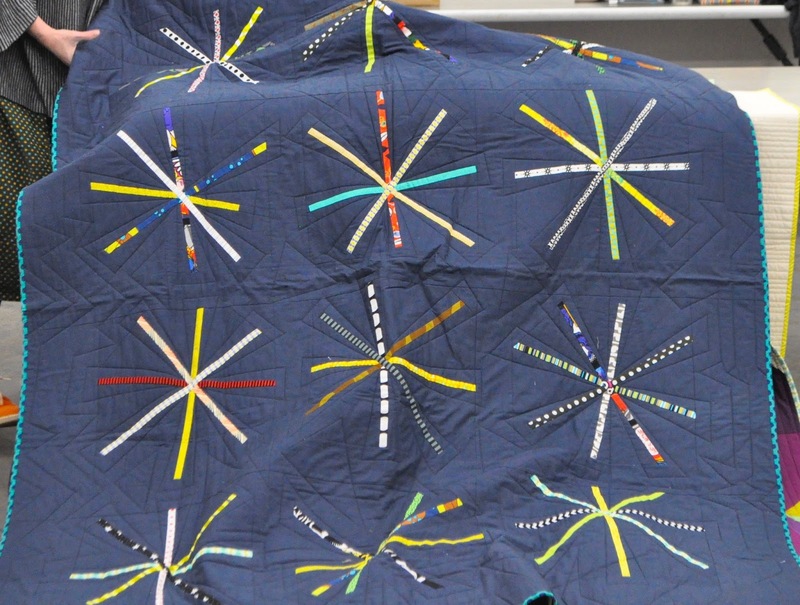 She wanted to give others the same feeling of "home" that she felt when she placed the well loved quilt on her bed. 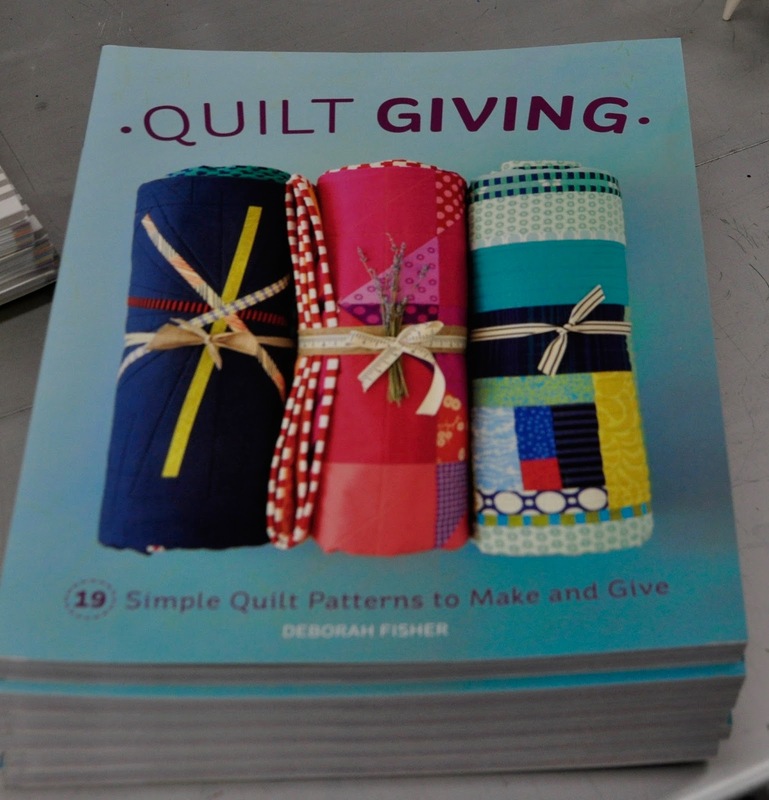 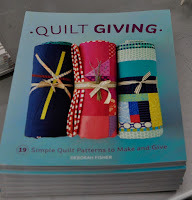 She wrote a book entitled Quilt Giving. 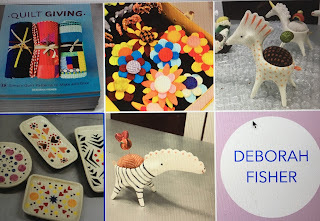 Deborah's father retired and took up furniture making and ceramics. 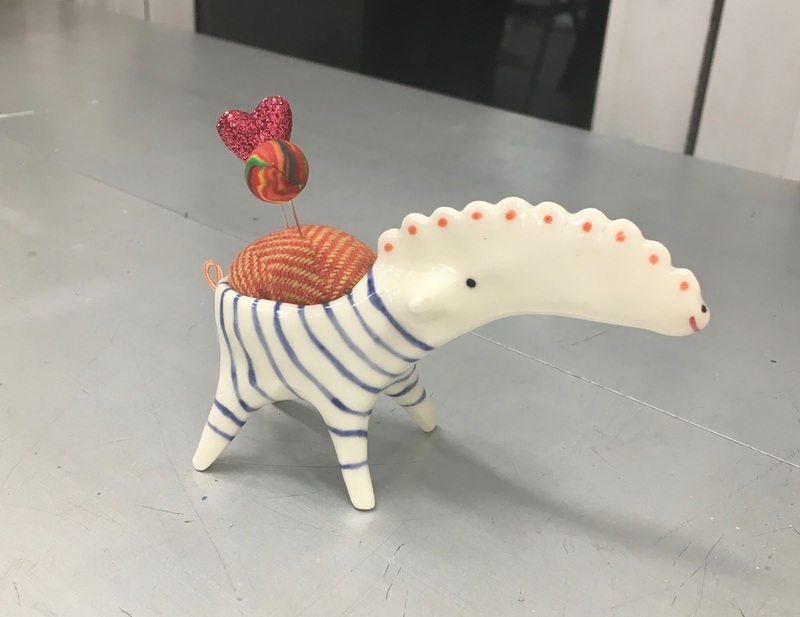 He asked her to join him in a ceramics class at the Art Center of Long Island. Her life as a ceramicist began. 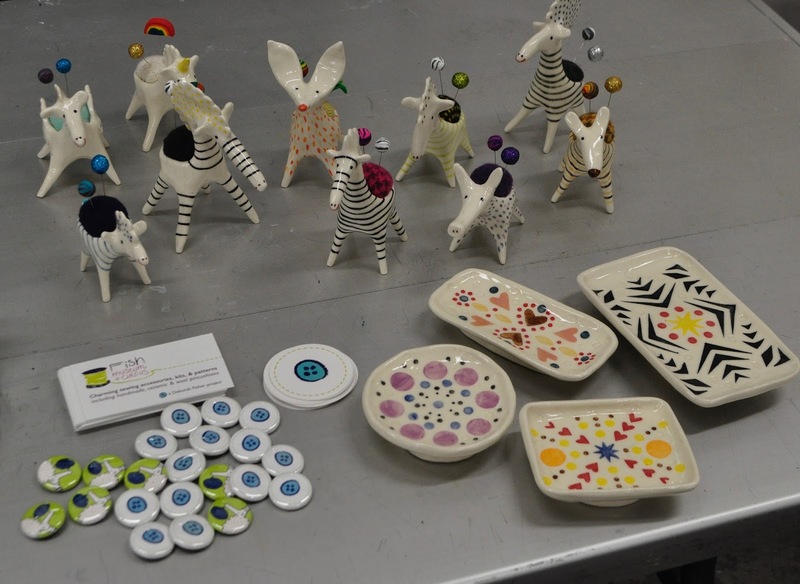 She started to create one of a kind animal pin cushions, sewing boxes and magnetic pin dishes. 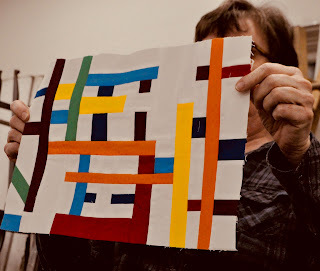 We love comments! 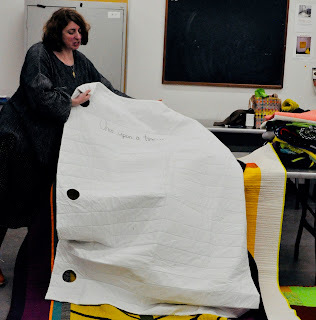 Please share your thoughts and ideas with us! The LIMQG meets every 3rd Wednesday of the month at the Art League of Long Island , 107 E. Deer Park Rd., Dix Hills, NY. 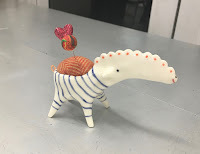 Meeting is from 7:30-9:30 pm. 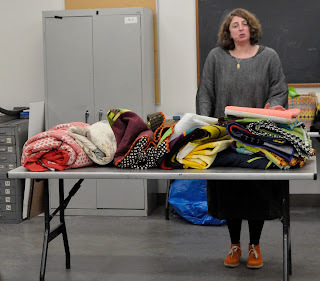 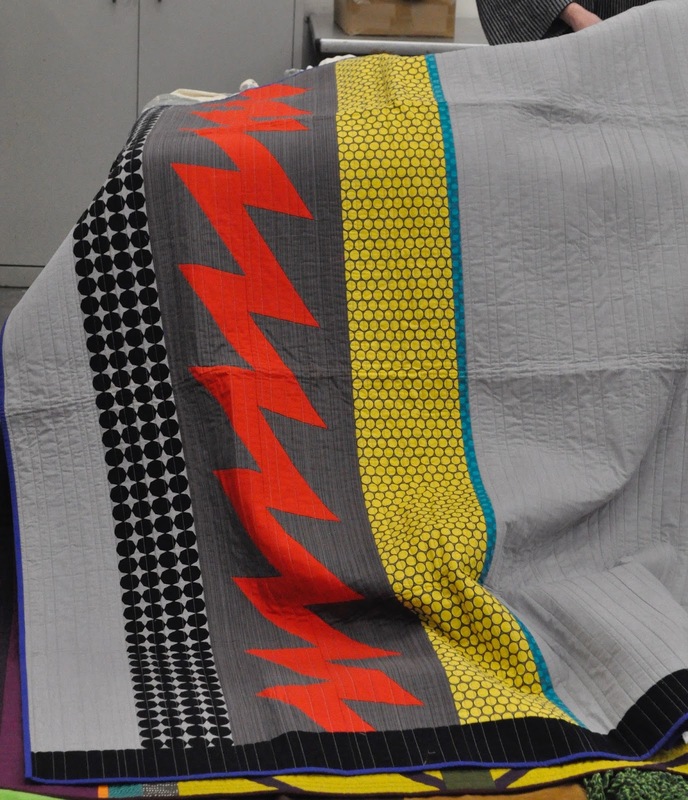 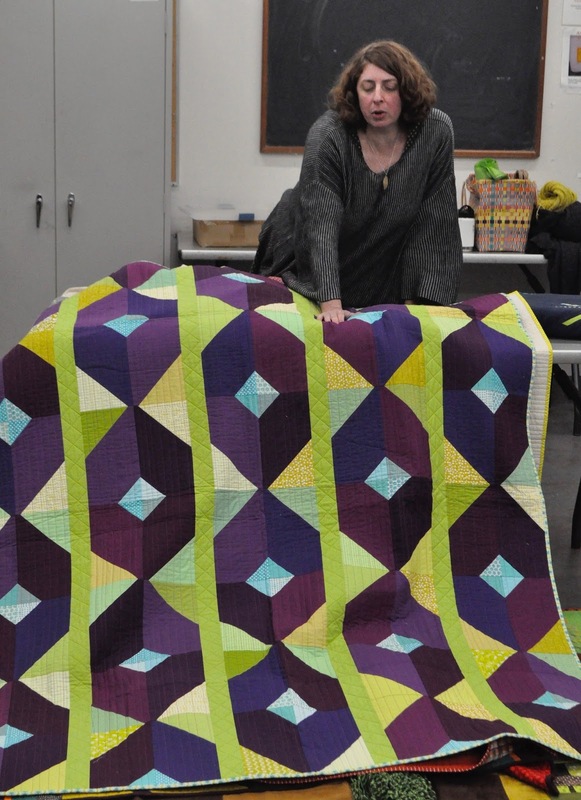 The Long Island Modern Quilt Guild was founded in October 2013. We are a group of like minded individuals from long Island, NY who share passion for modern and contemporary quilt designs. 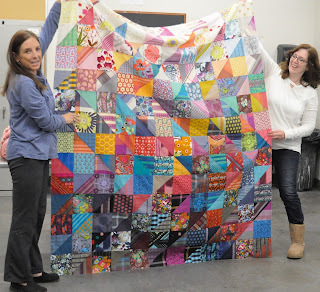 We meet once month to share ideas, learn something new from each other and show off quilts we have been working on. If you would like to join us, please send us a message at contactLIMQG@gmail.com or join us for one of our meetings. New members and new ideas for improving our guild are always welcome.